WHY PLASTIC SURGERY ISN'T A BAD THING | RAWR BOWS. Everyone has their own opinion about going under the knife in order to alter our bodies, or even about temporary procedures like the famous lip injections. We get angry when someone, for example Kylie Jenner, denies doing it even when it’s obvious her lips are much bigger. But when they do admit it, we get angry at them for doing it and we call them fake, because it now seems that if you get plastic surgery, you’re not real and all you care about is looks. Feeling confident in your own body is something many people struggle with, celebrities amongst them. Many of them have opened up to the media about certain parts of their bodies that they dislike and they would like to change. They’re only humans. Most of us just deal with it and learn to live with the body we were born in, we’re all different and beauty is 100% subjective. The reason why I think many celebrities decide to go under the knife is attention. We spend hours and hours looking at them, scrutinising their appearance and criticising what we don’t like, not realising that they are insecure too. When they gain some weight, their ‘before’ and ‘after’ picture is on the cover of magazines and all over the Internet (or just ask Taylor Lautner). We give so much importance to their looks and we make it seem so important that anyone would try to get rid of those insecurities, at all costs. In that case, I don’t support plastic surgery. I don’t think you should alter your physical appearance because someone else is saying things or because strangers think you’re not pretty enough. It’s literally impossible to please everyone and there will always be someone who’ll find a flaw. However, when YOU -without the influence of any negative comments from the outside- decide to do it because you know it will boost your confidence and will make you feel better about yourself, then please go ahead and do it. We constantly dye our hair, pluck our eyebrows, get spray tans, do our nails; and we do it to make us feel more confident. So why not plump our lips a bit or slightly change the shape of our nose? As long as it’s for the right reasons, there is absolutely nothing wrong with it. 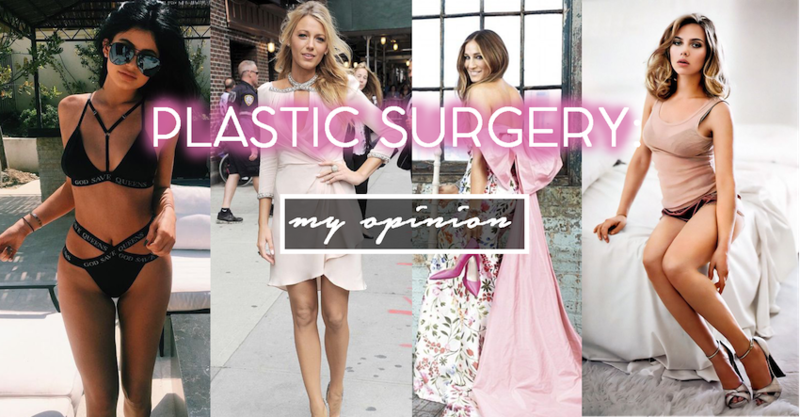 What's your opinion on plastic surgery?